Seems to be an awful lot of landscape talent on this board, so here's a question for you guys (and gals). I am trying to level out old tree stump holes, and a lot of uneven ground in sod. I have been trying to do this with a loader, a back blade, and a load of top soil. Not going well. How is a box scraper properly used and would this help? I also saw an implement that has a row of scarifiers and then a small roller with spikes comming out it. Are there other implements out there that would do a better job? The only thing that I have that seems to work is a wooden handled lawn rake, and that ain't gonna cut it. John, a box-blade traps the topsoil inside, the only way for it to escape is by filling the holes as you pass over them. Just what you want it to do by the sounds of it. Don't give up on your rear blade yet though, it is very easy to build, have built, or buy a couple of side plates to bolt onto your blade, effectively making a boxblade out of it. The implement you mention is called a pulverizer, and while it will act somewhat like a blade it is designed only to break up hard, crusty soil and do only minor final levelling, besides if there is any sod left it will only clog up the scarifier teeth on it. Best of luck. A box scraper 'properly used' should do the trick. As a relatively new box scraper user I can say that, 'properly used' is easier said than done. However, at worst, the box scrapper is still better than the loader. Even so, I still tend to use the back of the loader blade in float for smoothing. It also works reasonable well for doing small grading tasks, especially if loose soil is around. To use a box scraper for smoothing, the top link is lengthened enough so the blade doesn't bite. A hydraulic top link makes frequent adjustments on the scraper easy, and frequent adjustments are required to use a scraper well. To use a scraper for filling, it's easiest to use the rear blade like a dozer to cut high spots into low ones. The box then is better able to level. The problem that scrapers have for leveling rough ground is that: If the 3ph is held in position control, every sizable dip and rise the wheels go over is duplicated by the blade. On the other hand, the 3ph is floated, the blade just duplicates holes and rises that are wider than the blade. Grading seems to be something of an art. Just takes awhile to get command of the tool and an eye for the job. A box scraper is probably still the best tool unless the tractor budget is unlimited. I don't get bad results, but I am waiting for my command and my eye. Thanks for the great advise. I like the idea of building my own box screpper from my blade. Where does one get a hydraulic center link. I haven't ever looked for them but I don't recall ever seeing them in my local farm supply mega store. There may not be an accessory called a hydraulic top link. It's just a cylinder, hoses and connectors of particular specs that can be ordered from anyplace that handles hydraulic parts. I believe it's important for the cylinder to be heavy duty and the right length and travel for the hitch. I seem to recall a discussion, on tractorbynet maybe, where specs for a hydraulic top link were discussed. The archives could be searched. However, it might be easier to let a dealer rig up something. My hydraulic top link came as part of my 3ph pallet forks. It's a fairly short heavy-duty double action cylinder. I think the cylinder diameter is 2.5", but could be 3". Its loops are for Cat2 sized hitch pins, and I have sleeves to accommodate my smaller Cat 1 pins. The hoses are extra long, because I hook them on the loader bucket curl valve when the rear hydraulics are used for the pallet forks. I'll probably add a section to the spooling valves so I don't have to swap hoses if I need the bucket curl. Most of the time I'm using the forks, I have ballast in the loader, and I don't need the bucket curl anyway. However, it would be good to be able to go back and forth between forks and loader without swapping hoses. The link is very useful with blades and scrapers, and I probably will find it convenient with a snow blower. I don't use it with my backhoe. The possibility of the thing changing with me in the hoe seat doesn't seem like a good idea. 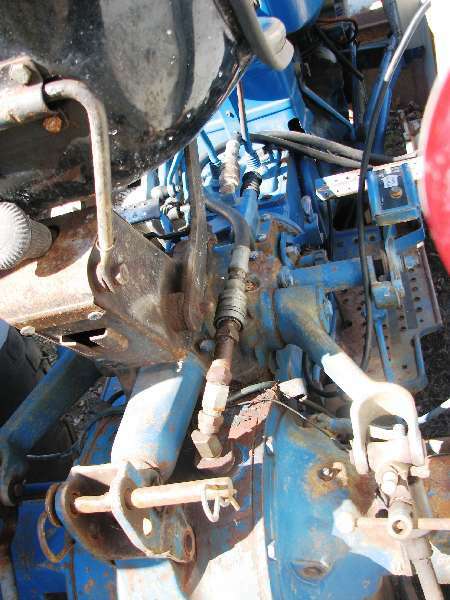 If you look in the archives on tractorbynet, you'll find a long post by Mark Chalkley explaining how to put a hydraulic top link (and side links) on your tractor. He did all three on his, and I want to put a hydraulic top link and one lower link on mine when I have both the time and money. find a dealer that handles gannon equipment.i had that setup put on a 335 in 1978.gannon has dedicated setups for several different tractors.a friend bought one for a kubota 4200 series a couples years ago.the cylindres were even painted kubota green from the factory.they put the controls in the slots on the tractor and it really looks good.i've had experience with other brands,but in my opinion gannon is the best.i have yet to put one on my boomer but i probably will.if you do this go the whole nine yards and get the tilt cylinder too.mijne has the three spole valve for the link,tilt,and also the scarifiers.good luck. Bird, I looked and searched all over for the post you mentioned by Mark, but I could not find it. If you come accross it, can you send me a link? And I found that a company named Tisco does make the hydraulic top link, so if your tractor dealer sells their products, he could order one, but it's more expensive than just buying a cylinder and making your own (or having it made up).